Orange Glo® Hardwood Floor 4-in-1 revitalizes hardwood floors by cleaning away dirt and grime, filling in scratches, protecting floors from water damage, and leaving a long-lasting, brilliant shine! Great for homes with pets and lots of foot traffic. 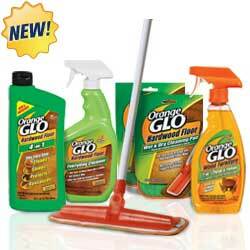 Orange Glo® is specially formulated for outstanding strek-free cleaning. Unlike oil soaps, it cleans away dirt and tough stains without dulling your wood’s finish. Also great for cleaning wood furniture, cabinets, and paneling. Orange Glo® Wood Furniture 2-in-1 Cleaner and Polish Spray. One spray wipes away grease^ grime^ and dull waxy buildup to reveal your wood’s natural radiance. With its unique formula^ Orange Glo can clean^ polish^ and protect in one easy step to revitalize your wood^ hide minor scratches and protect against moisture. And^ best of all you’ll fill your home with the scent of freshly-peeled oranges. Orange Glo® Wet & Dry Cleaning Pad contains millions of tiny, wedge-shaped microfibers that grab, trap, and absorb messes for quick, easy, and effective cleaning. Use with the Orange Glo Mop and other Orange Glo Hardwood Floor Care products: 4-in-1, Everyday Cleaner, and Refinisher.